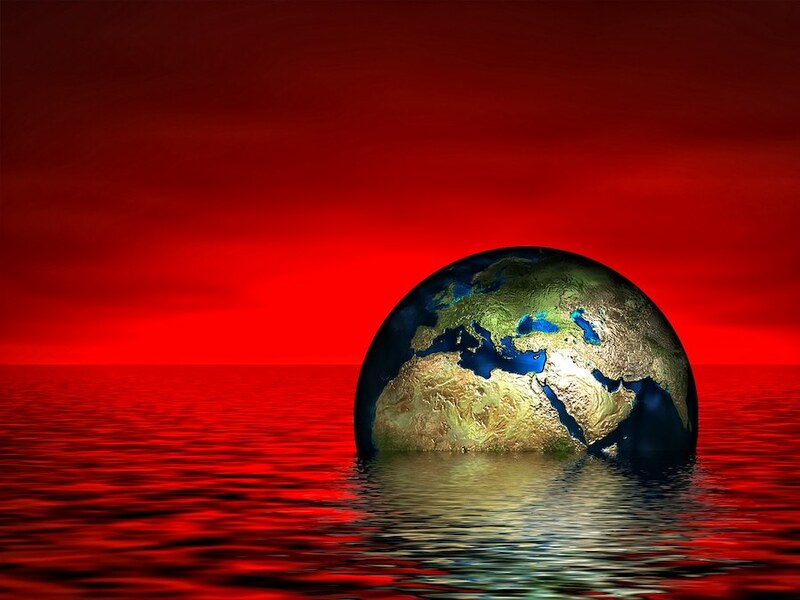 The popular media has failed to communicate the science behind climate change. The public does not understand the science of anthropogenic global warming and the urgent need for climate action. We cannot expect people to support mitigation and adaptation efforts if they do not have access to accurate information. Shoddy climate reporting has been an issue for a number of years. As reported by Grist, a study by the University of Colorado’s Center for Science & Technology Research indicated that climate reporting declined in 2013 compared to 2012. They documented mentions of “global warming” and “climate change” in five major U.S. newspapers. The New York Times coverage fell by 40 percent, the Washington Post’s coverage dropped by 33 percent. Declining coverage was also documented in the Wall Street Journal, the Los Angeles Times, and USA Today. According to Robert Brulle of Drexel University, the nightly news programs at ABC, NBC, and CBS aired only 30 climate stories in 2013, compared to 29 in 2012. When climate change is in the news, the information communicated is often inaccurate. According to a Pundit Fact analysis, more than half of all statements made on Fox News are untrue. Not only were more than half the statements on Fox false, less than 10 percent could be considered completely true. 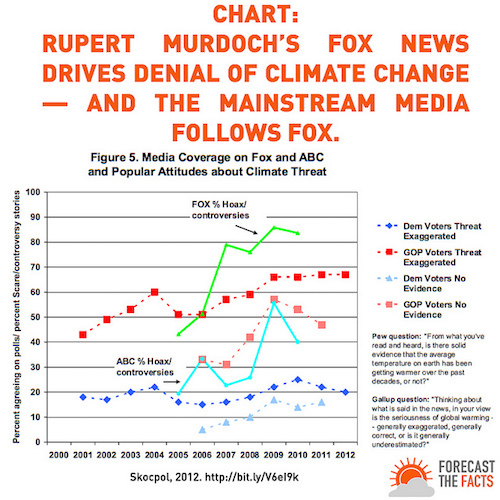 A study from the Union of Concerned Scientists (UCS) found that almost three quarters of Fox News climate coverage was misleading. Dishonest reporting at Fox News has also been covered by Mother Jones. A recent Grist article reported that CNN airs almost five times more oil industry advertising than climate coverage. Media Matters for America found that over a two week period, CNN aired 23 minutes and 30 seconds of American Petroleum Institute ads, compared to around five minutes of coverage of climate change and temperature records. These results cannot be attributed to an absence of breaking climate news as the data was compiled during a week in January and a week in March, in which major stories broke. In January, it was revealed that 2015 was the warmest year in recorded history and in March, it was announced that February broke a temperature record and with the largest temperature deviation. While they cite some examples of climate coverage, more than three years later, we are forced to concede that the answer is “no”, the hoped for shift from the media has not materialized. For years, the popular media has either under-reported environmental stories or covered them inaccurately. This has to change if we are to make the requisite paradigm shift. In the absence of factual climate journalism from the mainstream media, we need to find alternative approaches to inform the public. This is why citizen journalism is so important. Unlike traditional media, citizen journalists are not beholden to anyone or anything. They are free to speak truth to power and they are free to publish information that is being neglected in traditional media. If you value a fact based reporting, support citizen journalism. Tom Schueneman’s citizen journalism project focused on sustainable development is the kind of initiative that can help disseminate factual information you will not find in mainstream media. However this work takes time and requires your support. Click here to find out how you can help. – None (as in zero) of the doomsday predictions we’ve heard since the 70’s have EVER come true. – Every week, there’s another “scientific” paper describing another reason why the models are not correct (ocean currents, aerosols, radiation, Africa rainfall, etc). – No one has ever proven that any given climate or “weather event” would NOT have happened if mankind wasn’t burning carbon. – You have no end game. Just what is it you want (climate-wise), and what tangible results will be realized? – Ever here of Chicken Little? The scientific community and every government on earth refutes your absurd statements. You are clearly ill informed either that or your words are an act of subterfuge in defense of the fossil fuel industry. Whether you are simply deluded or a shill for big oil, humanity does not have time for your lies and neither do I.